Life is full of dangers. Even with a strong desire you will not be able to protect themselves from various injuries, injuries or cuts. Unfortunately, to run to the doctor on every occasion is impossible. It takes time and the ability to see a doctor there. Thus, you should learn how to treat the cuts on their own. So, what to do if you are not able to avoid the cut. For a start, treat the injury with 3% solution of hydrogen peroxide. This will prevent the formation of pus, because the foam is able to remove small grit and dirt from the wound. Refrain from brilliant green or iodine. Their use causes coagulation of protein in the tissue, which impedes healing. Apply 5% tincture of iodine on the skin around the cut. You can change it on the alcohol. In the following days, try not to wet the cut, because this can lead to infection. Wait until the fibrin will form a protective crust. 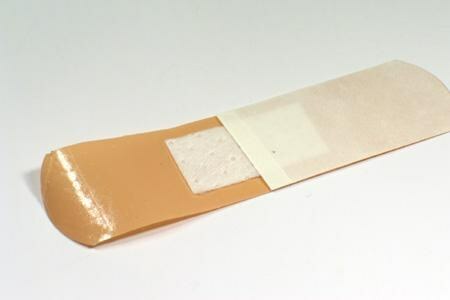 In order to expedite the process and protect the wound, use antibacterial patch. Don't forget to change it from time to time. Certainly, many have noticed that children pulled the injured spot in his mouth. Animals do the same – they just lick his wound. And for good reason. The fact that the salivary glands contain epidermal growth factor or EGF. It is a protein which is daily secreted in the mucous membrane of your digestive system. As example the history of hot tea. Most people for a day drink not one Cup of boiling water. However, no health problems are observed. At the same time the coffee spilled on the arm or leg, will be a long time to remind myself. The solution to this puzzle is quite simple – the content of EGF in mucosa of the digestive system is so great that a person does not have any bad feelings. All this gave scientists the idea of creating a special medicine on the basis of epidermal growth factor. It will allow you to quickly heal wounds and cuts. And while use own saliva and just lick the place cut. This will stop the bleeding and speed up recovery.